Welcome Back to Gotham City: "Gee, Ya Could'a Had a G8!" Well, this time he didn't have to be lugged around in a golf cart like a bag of clubs as with the close of last year's G7 summit in Sicily but he might as well have. For the second year in a row, Donald Trump proved to be the dead weight of the G7 conference. As usual, he was bound and determined to oppose the other six world leaders at every turn, engaging in whiny rants about the dubious virtues of protectionism and, of course, letting Russia and his boss Putin back in. The orange snowflake engaged in a childish rant today about the rest of the world robbing the United States "like a piggy bank" while the other world leaders were darting alarmed glances at him. Then, after showing up "fashionably late" for a meeting about gender equality, Trump left Quebec early for a summit in Singapore with Kim Jong Un that isn't going to be held for another four days. In other words, Trump put in the barest minimal effort at a conference in which he was barely smart enough to learn last year would be quietly hostile to his "America First" protectionism policies. No doubt, when he boarded Air Force One, the other world leaders silently breathed a sigh of relief so the grownups could decide on what appears be mutually agreed upon policies affecting the planet. The very optics of Trump rushing to leave a summit featuring six European, Asian and North American nations to jawbone with the type of tyrant with whom he's most closely aligned looks awful. 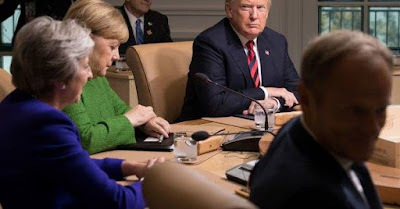 Really, Donald Trump is the Uncle Fester of world leaders and, instead of being the G8 again, perhaps for now the rest of the world would be better off if it was shrunk to the G6.